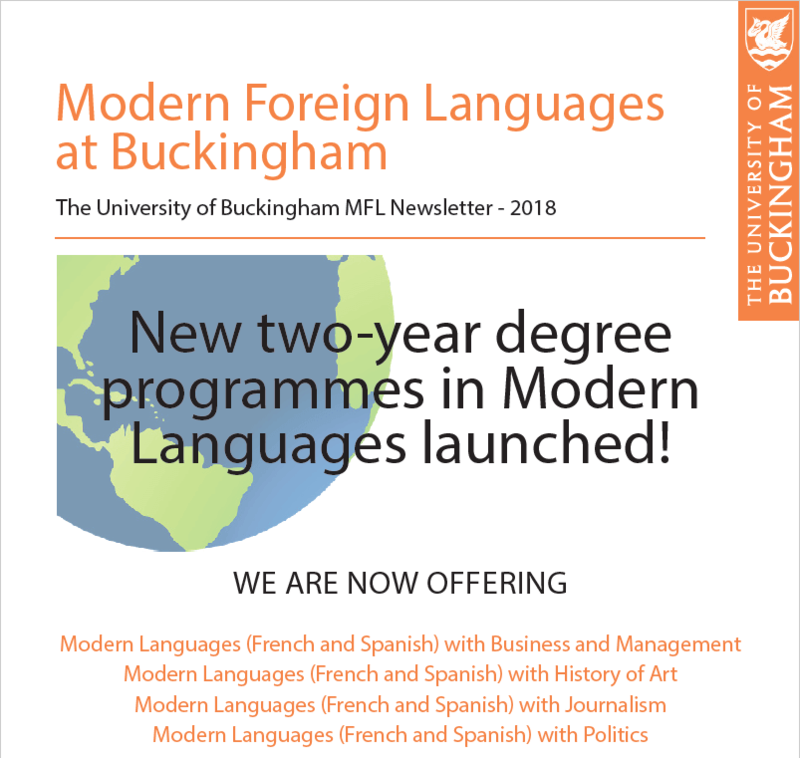 The University has always promoted the acquisition of foreign languages, and our Department is an established feature at Buckingham. Our language modules are popular because of their lively and interactive nature and because they complement the more essay-based and reading-intensive subjects. Studying a foreign language is an intellectual challenge that gives you access to another culture and way of life, and enhances your future job prospects. The MFL Department offers French language and Spanish language at all levels. Students can also choose to study languages (either French or Spanish) as a minor programme to complement study in Accounting, Business and Management, Journalism, Economics, English Literature, International Studies/Relations, Law, Marketing, History of Art, and Psychology. Please follow the links to the right of this page for details of all these honours degrees. Alternatively, you can choose to study a language as a free choice module (if you have a free choice option at some stage in your degree programme) or as a voluntary option. Language teaching takes place in the historic Chandos Road Building with its language laboratories, audio library, computer-assisted learning, and satellite TV and audio-visual facilities. As with so much at Buckingham, teaching is above all personalised. The quality of the student:staff ratio allows you to make faster progress towards a real understanding and fluency in another language. Read the Modern Foreign Languages blog here.